Librarian April Cushing is head of Adult and Information Services at the Morrill Memorial Library. Read her column published in the November 9, 2017 issue of the Norwood Transcript Bulletin. My family is big on wordplay—the sillier the better. Whether it’s deliberately mispronouncing or making up words for comic effect (strictly ours), overusing idioms (beating a dead horse), or simply quoting dumb movie lines, we delight in linguistic levity. As our Commander-in-Chief might tweet, “That’s just sad!” No doubt, but entertaining nonetheless. My ex-husband and I had a thing for Monty Python and Charles Dickens--“that’s Dikkens with two K’s, the well-known Dutch author.” Certain catch phrases, like this one from the Monty Python “Bookshop” sketch, still make me smile. If I was feeling particularly sorry for myself, my spouse would call me Mrs. Gummidge—the “lone lorn creetur’” in “David Copperfield” who “everythink goes contrary with.” The moniker stuck. It wasn’t all fun and games, however. As a high school English teacher, his students’ misuse of the mother tongue was no laughing matter. Those who committed the egregious error of spelling “a lot” as one word received an automatic “F”. Harsh? Perhaps. But if they gave a rat’s…I mean, if they cared a fig about their GPAs I bet they made that mistake only once. Our kids are forever quoting dialogue from favorite films--“Old School,” “Airplane,” “Wedding Crashers,” and “Groundhog Day” top the list. Before I left to visit my youngest, who was studying in Paris, her sister in San Francisco texted me, “Bring me back something French.” Really? I hadn’t planned on buying souvenirs, plus my carry-on was already crammed to capacity. If you want to impress your loved ones with your ability to recite random movie lines, there’s no shortage of material at the Morrill Memorial Library. My mother, from whom I inherited the unfortunate stickler-for-grammar gene, was renowned for her own quotes. Eyeing the cot on which she was to sleep during a weekend visit, she exclaimed, “Prisoners sleep on thicker mattresses than this!” Contemplating the walk from the car to the water for a day of family fun on the Cape, she complained, “This beach has too much sand.” And the last time she saw her bearded grandson, the Christmas before she died, she told him, “You look terrible!” Mom did not mince words--or beat around the bush. But back to my maternal parent. Regarding her youngest grandchild, who Mom believed showed particular promise: “At least she’s not going to grow up to be just a librarian.” Ouch. My daughter enjoys her job in TV news but once admitted that her dream was to be an archivist (read: librarian who likes old stuff). Have you heard the expression, “turning over in her grave”? While my mom was the Queen of Hyperbole, my partner—no stranger to the pun himself--dubbed his mother Cleopatra, Queen of Denial. Desperate for a girl after having produced three sons, she called her fourth child Mary for the first few days. The baby’s name was in fact Bill. Neither snow, nor rain, nor heat, nor gloom of night prevents me and my partner from tuning in to Jeopardy every night with our favorite host, Alex…Trebek! The only categories in which I have a snowball’s chance in…, that is, of distinguishing myself are those relating to language. “Proverbially Speaking” was a walk in the park, and I nailed “Words that Begin and End with N.” Although I’m hopeless in almost every other category, I still shout out an answer, or rather a question, each time. It’s extremely gratifying when I get one right. Except that when I don’t, the correct response tends to get drowned out in my eagerness to beat the buzzer. Another highly diverting word game is one we made up ourselves. If someone uses a remotely erudite or multi-syllabic word in conversation, the other will respond with a totally commonplace, understated comeback. For example, after a wedding we’d both attended, my friend commented, “Wasn’t the bride absolutely radiant?” Me: “Yeah, and she didn’t look half-bad, either.” When somebody was recently referred to as indigent, I couldn’t help saying, “He probably didn’t have a ton of money, either.” I engage in this type of witty repartee with just two people--my significant other and his ex-wife. It’s our way of poking a bit of fun at each other for using a ten-dollar word. I know, it’s just sad. Whatever form of wordplay floats your boat, the library will deliver. 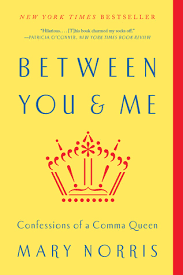 To learn the proper usage of “its” versus “it’s” or “me,” “myself,” and “I,” Strunk and White (“The Elements of Style”) are your go-to guys. But if you want to dig deeper and enjoy a few chuckles in the bargain, check out Lynn Truss’s British bestseller, “Eats, Shoots & Leaves—the Zero Tolerance Approach to Punctuation.” Another must-read for the serious word buff is “Between You & Me: Confessions of a Comma Queen” by Mary Norris, who chronicles her long career at The New Yorker and shares helpful tips and humorous anecdotes. In “Word by Word: the Secret Life of Dictionaries,” Kory Stamper compensates for her less than inspired title with an irreverent inside look at the life of a lexicographer for Merriam-Webster. Regardless of your particular quest, make haste to your local library. And if you don’t find the holy grail of linguistic treasures, or whatever it is you seek, I’ll eat my hat.